I am finding investing more than just a little bit frustrating these days. The reason for this is that I am struggling to find shares that I am comfortable owning for the long haul. To put it simply, I think my favoured high quality businesses are overpriced whilst the valuations on many so called growth stocks look very hard to justify. Instead these shares have become the playground of momentum and news flow traders – valuations seem to be of secondary importance. I don’t have the temperament or the skillset to try and make money this way. I also refuse to invest in poor quality businesses. I place a higher value on a good night’s sleep than taking risks with my hard earned savings. To help explain what I am getting at consider the valuations of two soft drinks companies – Britvic (LSE:BVIC) and Fevertree (LSE:FEVR). Britvic is a mature company that has been in business since the mid nineteenth century. It makes (or has the licence to make) some very popular soft drinks brands such as Robinsons, J2O, Pepsi and 7-Up. It makes and bottles its own drinks and is quite asset intensive. Despite this, it had profit margins of 13.3% and a return on capital (ROCE) of 18.2% in 2016. It’s a pretty decent business but it is finding it hard to grow its profits. Fevertree in comparison is a young company having been founded in 2004. It operates in a niche area of premium mixer soft drinks. It has outsourced its production and bottling to a third party. This and its premium-priced products has made it very profitable indeed. Its profit margins and ROCE are currently 33.6% and 39.8% respectively. Growth in profits has been rapid in recent years which has made Fevertree shares very popular with investors. But the stock market valuation of these two companies are poles apart from each other. Britvic shares at 692p change hands for 14.1 times it last reported earnings. On the same basis, Fevertree’s at 1705p change hands at a multiple of 71.9 times. The very simple explanation for Fevertree’s higher valuation is the higher expected growth rate of its future profits. But is such a big valuation gap plausible? I find this a simple and very useful exercise to weigh up the valuations of companies. Forget about speculating on future share prices, just look at a company from the position of owning it outright and what you might get back in return. To do this, just turn the current PE ratio upside down and divide the current EPS by the current share price to get the earnings yield. So for Britvic divide 49p by 692p to get an earnings yield of 7.1%. Fevertree’s earnings yield is 1.4%. If you invest £100 in both businesses, you will currently get £7.10 per year in profits from Britvic and £1.40 from Fevertree. But Fevertree is expected to grow its profits at a much faster rate than Britvic. At the moment it is expected to grow its EPS this year by around 15%. Britvic will struggle to grow by 3%. Now let’s assume that Fevertree can grow its profits by 15% per year for the next ten years – a much higher sustained growth rate than is currently expected – and that Britvic plods along at a pedestrian 3%. 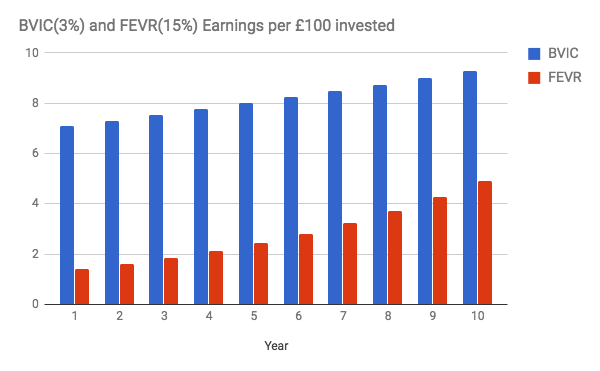 Despite a vastly superior growth rate, after ten years an investor would be getting £4.90 a year from Fevertree and £9.30 from Britvic. A Britvic investor would have pocketed a cumulative £81.40 in profits compared to £28.40 from Fevertree. 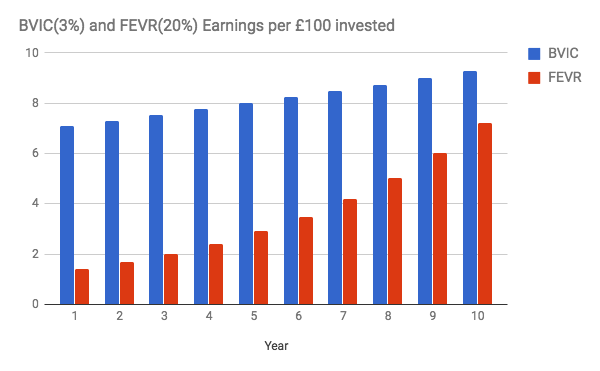 If Fevertree grew it profits by 20% a year, an investor would have £7.20 per year at the end of year ten, or about the same as they would get from Britvic now. They would collect £36.34 in cumulative profits – less than half the amount collected by an investor in Britvic. This is very simple but enlightening analysis. Leaving considerations about the very long-term future of both businesses aside, you might ask why any rational investor would buy shares of Fevertree over Britvic? Similar scenarios as above are being played out across the stock market at the moment. For me, it is a sign that investors could be paying way too much for perceived growth companies. Yet this is not seen to be a problem as long as profit forecasts continue to rise. When they do not, the pain can be significant. 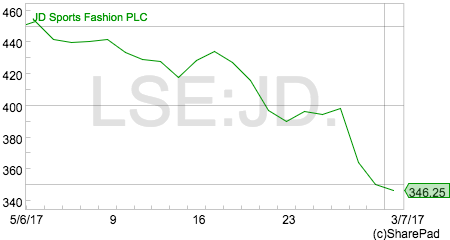 Last week, JD Sports (LSE:JD.) released a very lukewarm trading statement which ended a cycle of analyst forecast upgrades. The shares duly tanked. Over the last month, the valuation of the shares has fallen from a forecast PE of 21 to 16. JD Sports was not outrageously priced compared to many growth stocks. Ask yourself what kind of damage the market will inflict on shares trading on 30, 40, or 50 times earnings – or more – if profit forecasts disappoint? Momentum investing can make you very rich but very few people are good enough to make consistently high profits from it. For the uninitiated or over-confident it is very much like going for a bike ride starting with the wind on your back. It feels easy until the road turns and you start riding into the wind. The last bull market saw some people look like investing geniuses (especially those using leveraged spread betting accounts) for a while only for them to give back most of their gains when the market turned. Are we at such a turning point today? We could be. I think there are many shares where the risk-reward trade off is not only unfavourable but possibly downright dangerous. It is often said that shares are a good hedge against inflation. I think that’s only partly true. When inflation is modest – say 3% or less – then history tells us that shares can do well. If inflation lets rip, as it did in the 1970s then shares can be a very bad home for your money. I don’t think we are anywhere near the return to the hyperinflation of the 1970s or even the high levels of inflation seen in the late 1980s. 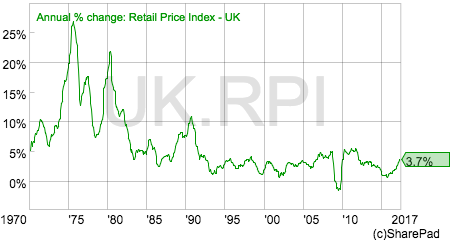 However, inflation does seem to be on an upwards curve with the retail price index (RPI) now at 3.7%. Whatever your aim is as an investor, your bare minimum objective should be to beat inflation. Inflation reduces the buying power of money. Investment returns below the rate of inflation means that your portfolio will buy less stuff and leave you poorer. What does rising inflation mean for investors? The outcome can be quite benign if companies can preserve their profits by passing on increases in costs to their customers. This is not easy when many consumers in the UK are seeing their wages grow slower than inflation which means their monthly pay packets will buy less goods and services. This backdrop makes it harder for companies to grow their earnings. However, rising inflation can have significant implications for investors in growth stocks. Growth companies are expected to have much higher profits in the future than they do today. Higher inflation means that the buying power of those future profits – and therefore their value – will fall. As share valuations are the estimated value of future profits in today’s money (or present value), higher inflation can do significant damage to the share prices of growth stocks. Value stocks – cheaper shares – have a much higher proportion of their value explained by their current profits. This makes them less vulnerable to a rise in inflation. What I am essentially arguing here is that the PE ratio of shares should fall when inflation rises. This means that higher valued shares are more vulnerable than lowly valued ones. Over the last 30 years or so, gilt yields have averaged around 3% more than inflation as measured by the retail prices index (RPI). This is because investors rightly demanded a premium return over inflation to preserve and grow the buying power of their money. In recent years, that inflation premium has disappeared entirely as the gilt market and interest rates in general have been manipulated by central bankers. The yield on 10 year gilts is significantly less than inflation and has been for some time. This scenario can explain why the stock market has been so buoyant as investors have chased the higher yields available on shares. Below I try to show how the PE ratio on shares in general – ignoring company-specific growth rates – changes with inflation. It is based on the Warren Buffett valuation model of cash profits. Here the valuation of a business is determined by dividing cash profits by the long-term yield on government bonds. By adding 3% premium to rate of RPI inflation, the investor is using a much more conservative interest rate to value shares than using an artificially low gilt yield. 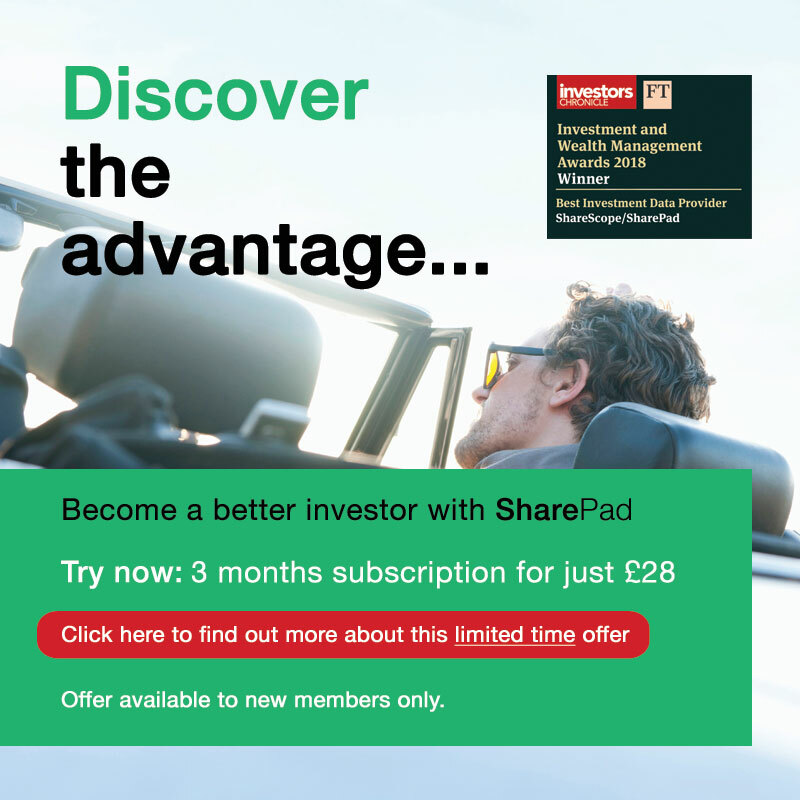 This gives them some protection against overpaying for shares. You work out the maximum PE ratio by taking your inflation-adjusted interest rate and taking the reciprocal of it. This is calculated as one dividend by the interest rate as shown in the table below. This is not meant to be an exact science, more a way of showing you the impact that inflation can have on business valuations. What you can see is that the PE ratio falls as inflation rises. A year ago when inflation was 1.4% a PE ratio of 22.7 would have been acceptable according to this approach. Now it is suggesting something nearer 15 due to the rise in inflation. In 1974, at the trough of the 1970s bear market, the PE on the London market was close to 4 times as inflation neared 20%. How do investors protect themselves? The twin threats of high valuations and rising inflation have increased the risks for equity investors in my view. But it does beg the question as to how investors should try and protect themselves. The easiest option is to increase their cash holdings by selling out of expensive shares. Quite a few respected private investors I follow on Twitter have been doing this in recent weeks as have I. The cost of this is twofold. You miss out on the gains that come from companies that continue to do well and also see the value of your cash balances nibbled away by inflation. Some commentators suggest owning gold as an inflation hedge. I am not a fan of this approach. Gold is historically more volatile than shares and failed to protect investors during the financial crisis when all asset classes moved downwards at the same time. Gold also pays no income. When you buy gold you are reliant on someone else paying a higher price for it in the future in order to make money. You might be in for a long wait. Index-linked gilts have negative yields and look like they could be an expensive form of inflation protection at the moment. The other pragmatic approach for markets such as these is to buy high-dividend-yielding shares. I’ve always had a lot of time for the power of dividend investing. It’s not exciting by any means but it does have a lot of attractions. Dividends are tangible returns for investors. Unlike a rising share price which can reverse, once a dividend is paid it cannot be taken away from you. The returns from high-dividend-yielding shares also tend to be a lot less volatile – as long as the dividend is sustainable of course. You can also compound your returns by reinvesting your dividend income to build up the value of your shareholding and your annual income from it. The one risk of investing in high-yielding shares during an inflationary environment is that governments or central banks tend to increase interest rates to control inflation. This would usually cause the price of high-yielding shares to fall as savings accounts and bonds become more attractive. But we are currently living in strange times. Interest rates have been near zero for nearly nine years. The UK economy is very dependent on credit and the value of property whilst households still have lots of debt. I might be wrong but the Bank of England knows all this and is likely to let inflation run rather than increasing interest rates in my opinion. This removes a possible threat to the value of high-yielding shares. Utilities have been under a cloud due to political uncertainty. Water and electricity shares are also exposed to regulatory risk which could see their revenues and dividends cut. However, there could be some value in the water sector. Pennon has a 4.6% prospective yield and a dividend policy to increase payout by 4% more than inflation until 2020. SSE has a policy to increase dividends in line with inflation but looks more risky as dividend cover has fallen sharply in recent years. Financial shares were hammered during the last recession but have spent the intervening years cleaning themselves up and becoming less risky. Maybe this sector is worthy of consideration for dividend investors again? Real estate investment trusts (REITS) pay out virtually all their profits as dividends. REITS can be quite risky investments as asset values are very sensitive to changes in interest rates. Also some rental income – and therefore the dividend – is less secure than others. I would be particularly wary of REITS with high exposure to retail properties given the difficulty being faced by many companies in that sector. It is also probably wise to avoid paying big premiums to net asset value (NAV) if you are thinking of investing in this sector. The shares above are seen as very cheap or distressed in that their forecast PE is less than the forecast dividend yield. The very high yields seen here are often dividend traps as there is a good chance that the dividend is at risk of being cut. Trinity Mirror is the standout share for me here. Its shares are extremely cheap due to its rapidly declining print media business and very large pension fund deficit. Having said that, its 5.8% forecast yield is covered six times by forecast earnings (free cash cover will be lower due to pension top-up payments but will still be comfortable). I’ve been tempted to buy this share many times but its two big problems have always put me off. Buying a share for its high yield alone is never a good idea. You should take some time to understand the business that pays the dividend and consider all the risks involved.